The ketogenic diet is known for balancing your blood sugar and busting cravings and midday energy slumps. Still, it’s nice to have the option of a few low-carb, keto snacks for busy days when you have to skip lunch or after a tough workout. And if you find yourself snacking a ton? You might want to take a look at your meal plan. Not eating enough throughout the day can lead to over snacking and fatigue. Not sure how to meal plan? No problem. Click here to get your FREE keto meal plan now. Meal prepping is one of the best ways to set yourself up for success — but we all know life gets busy. 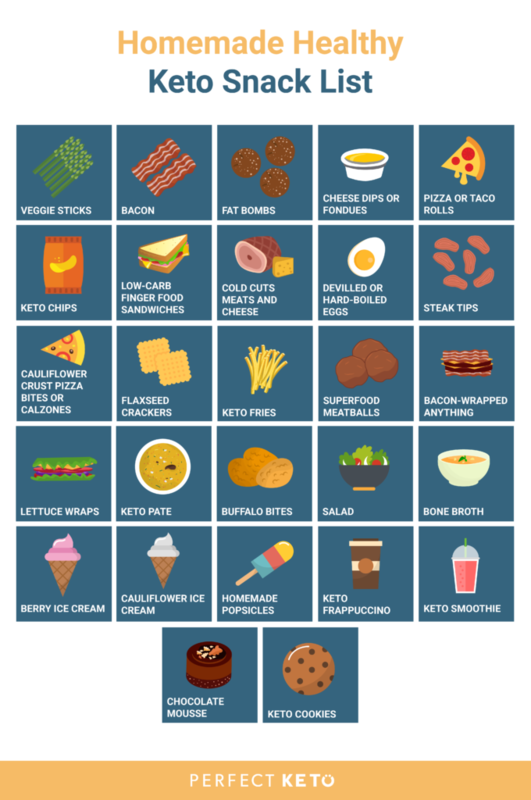 Here’s a comprehensive list of quick snacks you can purchase already made. Remember — these aren’t meals, and over-snacking can lead to stalls in weight loss. Make sure the brand you choose is no- or very low-carb with very few added ingredients. Be wary of anything with added sugars, as that will kick up the carb content. Recommended Keto Carne jerky here. Make sure it’s the full-fat version without added carbs or other fillers. Choose higher fats choices, such as almonds or macadamia nuts, and seeds high in omega 3s like flaxseed and chia. Perfect Keto Nut Butter is a high-fat, zero-sugar added blend that comes in convenient single serving packets. Grab a box of those for your bag or your car for a quick serving of fat on the go. If you’re interested how nuts can affect you on a ketogenic diet, check out our Full Guide to Nuts on the Ketogenic Diet. If not sweetened with stevia, make sure it’s at least 80% cocoa content or higher, as the carbs can add up quickly otherwise. Here is a low carb friendly chocolate. Make sure there aren’t any added ingredients that contribute extra carbs. Also make sure there aren’t weird flavors or massive amounts of oils in these. They can be added as an extra crunch that you can sometimes miss on keto! Here is a recommended brand. Choose the full-fat versions. Try to get real cheese if you can, but these in a pinch if you need convenience. These are a nice low-carb alternative to chocolate chips! They have the same type of crunch, are way more nutrient dense, and very low carb. Watch out though, you can definitely overdo these. Here are Terrasoul cacao nibs we like. GREAT choice because they’re a whole food and very easy to eat “as is.” Just add a little salt and pepper and you’re golden. Maybe even a little olive oil in that perfect hole in the middle. Not only do these provide a healthy dose of fat and other nutrients, they’re also zero carb. This is highly recommended by keto-gurus, Dom D’Agostino and Tim Ferris. Here is Wild Planet, the brand they recommend. Use as a crunchy no-carb alternative to crackers or chips. Many of these are low quality and fried with nasty oils. Not these Pork Clouds! These are highly processed, so limit them and try to find organic and hormone-free if possible. Great paired with a high-fat cheese. Drink it black (no added sugars) or only with full-fat milk or cream or MCT oil powder. Unflavored, chocolate and vanilla MCT oil powder here. If buying these, look for no added sugars—or make them yourself at home using coconut oil, lard, or ghee. Rhythm is a great brand of kale chips. Keep these to a minimum and as a last resort, such as if you’re traveling and left without anything else. While they’re low-carb due to erythritol as a sweetener, they’re also processed with a few weird ingredients so keep them for emergencies. Find Quest Bars here. Choose bars that are high in protein and healthy fats, 3 grams of net carbs or fewer, and free from added sugars, sugar alcohols, chemicals, gluten, dairy, soy, or corn. Check these out. Limit these for special occasions, as they’re highly processed and provide no added health benefit. Don’t overdo these as the carbs can pile up, but a great grab and go handful when in a pinch. Great right out off the olive bar if you can find one! Just try to make sure they don’t have any other oils but olive oil in them. Mix it in any drink and you have a keto friendly version of it (if there are no carbs to start). These next keto snacks take a teeny bit of effort but will bring your quality keto game to the next level. Slice your favorite keto-friendly veggies and store in the fridge so they’re easy to grab and go. You could dip these in homemade guacamole or eat with full-fat cheeses. Cook some ahead of time to have on hold for snacks on the go. Meat is a satisfying and delicious snack that will help you nail your protein and fat macros. Don’t worry about eating “too much” meat — it won’t kick you out ketosis. Stuffed with healthy fats and so easy to make at home! Try Macadamia Nut Fat Bombs, Peaches & Cream Fat Bombs, Mocha Fat Bombs, or Anti-Inflammatory MCT Fat Bombs. Store in the freezer right after making, then keep in a travel cooler until ready to eat. Use baked full-fat cheese as the “wrap” and fill with pizza or tacos meats and spices, like these Breakfast Tacos. Make them from cheddar cheese baked in a dished until crispy, then cut up into chip triangles. Use something grain-free as the “bread,” such as cheese, lettuce, spinach, or hormone-free deli meat. Just simply roll healthy lunch meat around a full-fat cheese. This works well for a quick snack or party appetizer. Packed with protein and nutrients, eggs are like nature’s ready-made snack. Cut them in half and sprinkle salt and everything bagel seasoning or whip up a batch of your favorite devilled eggs. If you haven’t tried a cauliflower crust yet, it’s time. Prep these ahead of time and keep them in the fridge for emergencies. Make a batch of these super filling crackers to eat with cheese, cream cheese, or just grab a few for the road. Packed with nutrient-dense seeds and spices, you’ll fulfill all your cravings with the carbs of normal crackers. You can make fries out of any low-carb veggies, like these Celeriac Everything Fries. Make some and reheat when you’re feeling like a quick, salty snack. Everyone loves a good meatball. Luckily, these are always quick to prepare and save for a healthy meat snack on the go. Ideas could be mozzarella sticks, jalapeno poppers, asparagus, or beef. This is a popular one for parties. Try the bacon-wrapped asparagus in our Keto Power Breakfast. Wrap your favorite meat and low-carb spices in some lettuce leaves like in our Curry Chicken Lettuce Wraps. Make a quick spreadable paste with meat and cream cheese to put on veggies or keto-friendly crackers. Try this Smoked Salmon Paté with Cucumber. Easy to make and keep on hand in the fridge, these buffalo bites are the perfect option for a quick and delicious keto-friendly snack. Sip on some anti-inflammatory bone broth when you want something low-calorie and comforting. Add fresh herbs, salt, and pepper for some extra nutrients and flavor. Berries are some of the only fruits on your keto “yes” list. They’re lower in sugar than most other fruits and are packed with beneficial antioxidants. For a simple “ice cream,” blend your favorite frozen berries with some coconut cream or heavy cream to form a healthy keto-friendly ice cream in just minutes. Who knew ice cream could be good for you? Like in this Superfood Nice Cream, for instance. Grab a scoop for a quick dose of fats and nutrients to keep you going throughout the day. And with zero added sugar, you won’t have to worry about a crash. Try these Mint Chip Popsicles with Micro Greens for a dose of micronutrients and fat to keep you full for hours. A filling Frappuccino with all the healthy fat and none of the sugar. Check out this recipe for a quick and easy drink you’ll love first thing in the morning or after a hard workout. Mix heavy cream with some cocoa powder and a little vanilla for an easy keto mousse. Add some stevia, if needed. Here’s an easy nutrient-dense version: Perfect Keto Chocolate Mousse. Try this Chewy Chocolate Chip Cookie or these Lemon Cashew Cookies for a sweet treat. 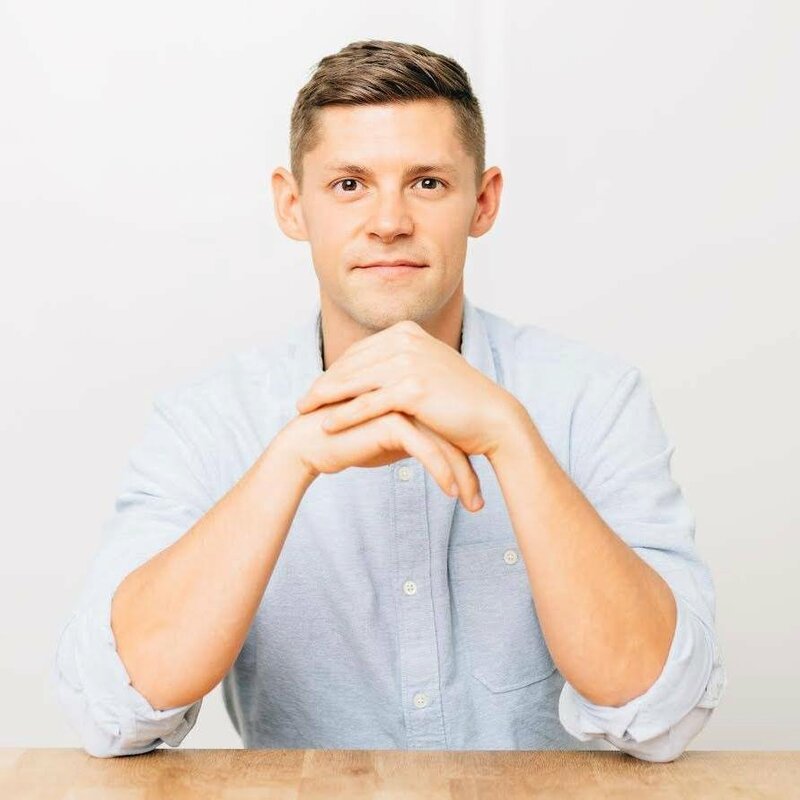 Check out a quick keto friendly matcha latte recipe from our founder Dr. Anthony Gustin and follow him for more recipes! “Low-carb” doesn’t always mean keto-approved. Many low-carb snacks (like Atkins products) will quickly kick you out of ketosis if you aren’t careful. This is because many of these so-called “healthy low-carb” snacks are loaded with unnecessary ingredients that could spike your blood sugar and usually contain a very high protein content — both of which are big no-no’s on keto. Remember, the ketogenic diet is damn near zero-carb and moderate protein. Here’s a reminder of the macronutrient distribution. Try to stick to whole food-based snacks as much as possible — preferably homemade. But, we’ve provided a lot of quick ideas too for when that’s not possible or if you’re too lazy. And remember, food is supposed to go bad. Stick to foods that don’t make health claims (healthy food doesn’t need to say that it’s healthy). Stick to foods that have less than 5 ingredients. Stick to the outside circle of the grocery store. 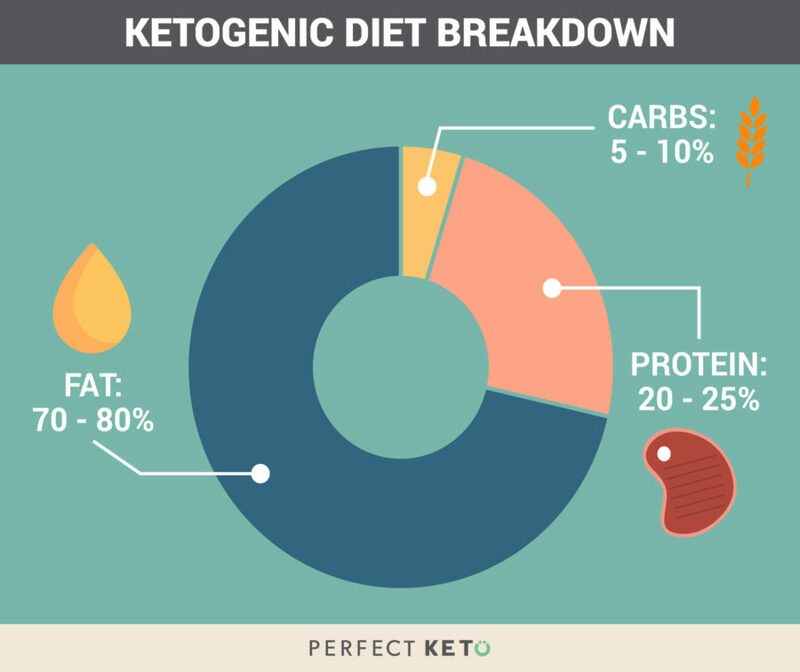 Another difference between the ketogenic diet and your run-of-the-mill low-carb diet is the macronutrient ratios. Since you have to be careful about not only keeping your carb count low but also moderating protein, you’ll want to focus on getting plenty of fat. A great way to do this is from your keto-friendly snacks. Now that we have those guidelines in place, let’s dive into some ready-to-eat keto snacks. 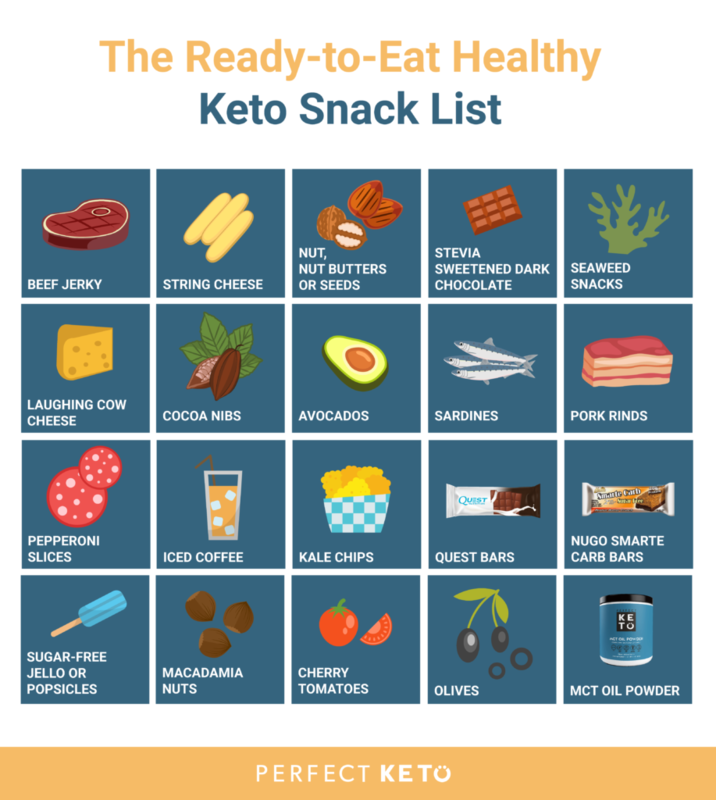 There are a few do’s and don’ts to pay attention to when snacking on the keto diet. Get caught off guard! Use this snack list so you don’t find yourself unprepared and accidentally smash a bagel. Thinking that eating prepackaged pork rinds or bars with fake ingredients is high-quality keto isn’t doing yourself any favors. Take the time to prep high-quality snacks for yourself and reap the rewards. #TestDon’tGuess. Not sure if a snack is keto-approved? Test your ketone levels and answer this for yourself. And before you go, don’t forget to click here to get your FREE downloadable keto meal plan now. I’m a little confused i really don’t know where are how to begin. How do I find my marcos. Many high fat is also protein. How do I know what those fats are that are low or zero protein. Seems impossible to get that balance of 70-80 % fat vs 20-25% protein? Hi Evelyn, it will take some time to get the hang of it. Egg yolks, fattier cuts of meat, mct powder, coconut oil, butter, fatty cheese, these are all examples of higher fat sources. I used the calculator to get my macro goals. Is my carb goal referring to net carbs or just carbs? It can make a difference when I am tracking. PS- I love sweet tea. Like live off of it. I wake up and crave it, SO if I don’t drink nearly AS much as I do now, is that okay or do I need to cut it out altogether? Debbie, some people track total and some track net. I personally track total because it takes out any guess work and I’ve seen superior results with my clients, especially when first starting off. Awesome site, how do u get all this information?I’ve read a few articles on your site and I love your style. Thanks a million, keep up the great work. You can make sweet tea with a keto-friendly sweetener like Swerve or Pyure. But don’t have the regular kind. I’ve discovered a lot of useful information on your site this page in particular. Thanks for posting. Thank you for the blog, it truly is loaded with a lot of useful information. Whoa! This might be by far the most helpful thing on the matter I’ve ever found. Thanks for your hard work. It’s net carbs on the macro calculator Debbie. Do deli meats have to be fresh from the counter deli or can they be packaged? There do seem to be some good options already packaged. I am preparing to start my journey and gathering my info. Thanks. Enjoying your site. “Watch out for processed meats because they can contain extra ingredients with added sugars and carbohydrates. Quality over quantity here. Since you want to keep your fat content high and protein moderate, make sure the proteins you do choose are mostly high-quality, healthy, and nutrient dense. Best choices would be grass-fed and pastured-raised versions of beef, organ meats, bison, and lamb, as well as fatty wild fish. @Gwen- I usually find my “marcos” by yelling “Polo!” in the pool.